This next car comes from Terry B who writes: Not much information here, but all things wrong with a jeepster has been replaced. Do not think you could modify a jeepster for the asking price. 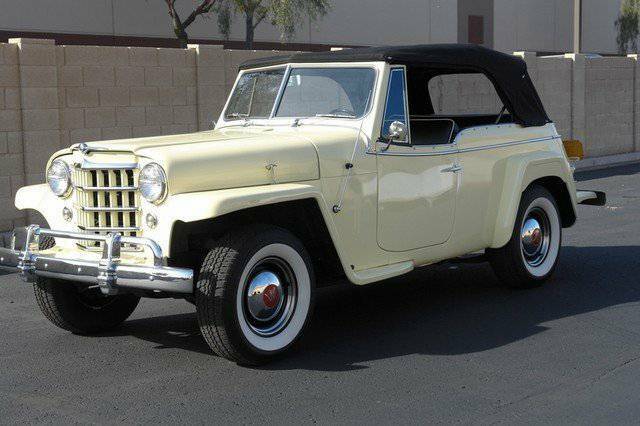 Find this 1950 Willys Jeepster offered for $14000 in Sacramento, CA via craigslist. Willys Jeepster with a total frame off restoration. Equipped with all late model running gear including a Chevrolet Vortec V-6, 700R4 Automatic Transmission, Disc Brakes with Anti-Lock, Independant front suspension, All new tires, All new Paint, All new interior. all that work and only the one picture.. The problem with a restomod is that you no longer have a classic car. Whoever buys it, will have to accept that it's not original... more fun to drive, but not original.